What’s the story: After the events of Captain America: Civil War, Peter Parker (Holland) is frustrated to be stuck back in Queens. But, adventure and danger crash into his life when Adrian Toomes aka Vulture (Keaton) brings destruction to New York City. What’s the verdict: Despite the titles of his 2012 and 2014 outings, Spider-Man hasn’t been amazing for some time. 2004 in fact. Kudos to Sony then for allowing their friendly neighbourhood IP to join his pals over in the Marvel Cinematic Universe. The pointedly named Spider-Man: Homecoming makes good on that extended cameo in Captain America: Civil War, fizzing with the same excitement and (kid-friendly) peril that wowed us in Sam Raimi’s first outing. Wisely, director Watts and his five co-writers largely assume knowledge on the origins story. This Spidey is way after that spider bite, comfortable with his powers and enjoying his dazzling suit c/o Stark Industries. Bumming Peter out is Tony Stark’s refusal to let him join Team Avengers until he’s learnt the superheroes ropes. All under the reluctant guidance of Jon Favreau’s misnomer’d Happy Hogan. Not that this stops him investigating why low-level criminals are suddenly packing hi-tech weaponry. And how Adrian Toomes, aka Vulture, fits into all this. Problem is, with great power comes great responsibility. And one of Homecoming’s most interesting features is how great power can create great peril, even if used by someone with good intentions. Amusing minor property damage escalates into more hazardous (and spectacular) mishaps as Peter pursues Toomes (and cronies, who will please fans of the comics). 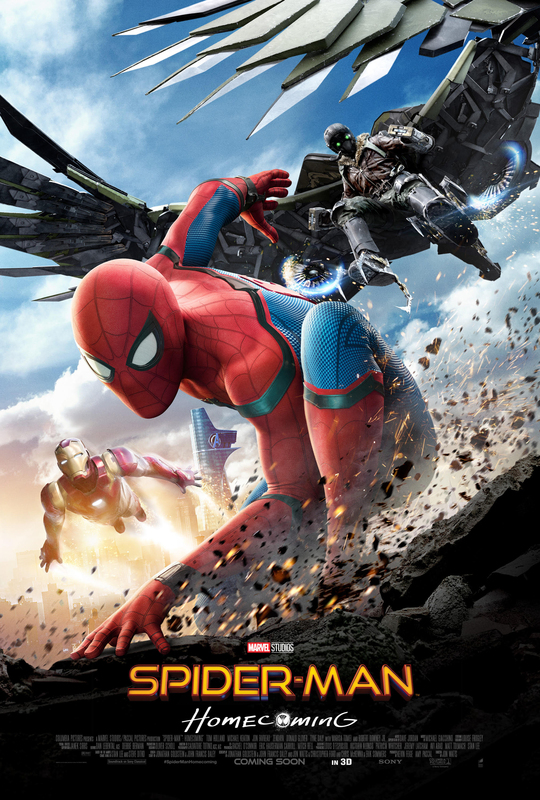 This is still hero’s journey stuff, and it was a nifty move to make this the youngest screen Spider-Man to date; all that 15-year-old optimism and reckless energy is good for relating back to big life-lessons , here delivered by an increasingly irritated Stark (Downey Jr. great as always). Watts (whose feature career up to now consists of two minor indies, Clown and Cop Car) blends action and genuine character in a way that has eluded recent MCU movies. Anyone care what happened in Doctor Strange and Guardians 2? With Homecoming, you’re rooting for Peter and understand the shading of Adrian Toomes, a blue-collar business owner contracted to clean up NYC after the first Avengers movie, but screwed over by big government and private enterprise. There may be decades of difference between the 21-year-old Holland and the 66-year-old Keaton, but they are electrifying on-screen rivals. Holland brings vulnerability, likeability and resilience to his Parker, with at least two more films in him before three shaves a day doesn’t work anymore. Keaton, an actor unable to just phone it in, is here given a much better birdman than in that overblown Oscar winner. Villainous to be sure, but with recognisable motives and a drive to achieve the American Dream. Supporting characters, from best friend Ned (Batalon, making the most of his “chair guy” sidekick) to love interest Liz (Harrier, whose character is named after comic Peter’s first crush) to a vivacious Aunt May (the sparky Tomei) flesh out a real world also lacking in many current superhero movies. Zendaya, Donald Glover and Martin Starr also people a superb supporting cast, the first two laying groundwork for later movies. Meaning there is crucial emotional investment when the action erupts, highlights being a Washington Monument rescue, a crisis aboard a ferry and a climactic plane set-piece (all of which feature in the trailers, but have some surprises in the finished film). Plus, in this age of proud stupidity, there is an admirable element of self-improvement to Spider-Man: Homecoming. Peter, Liz and Ned are on the school’s academic decathlon team, joined by Peter’s classroom nemesis, Flash (Revolori), once a jock, now a brain. Science whizz Peter also does Batman style sleuthing to uncover the mystery behind the super-weapons. And the audience themselves will be rewarded for attentiveness with a couple of big twists (that this reviewer didn’t see coming). Spider-Man: Homecoming is proof positive of how wonderfully immersive Marvel’s Cinematic Universe can be. The world building now allows for passing references and background details that ground earlier movies in this here and now. A place where Captain America gives high school pep talks and detention reprimands via corny pre-recorded links. And, it’s just thrilling to watch Iron Man share screen time with Spider-Man. Spidey comics are also mined in key moments, most impressively a spot-of fallen masonry bother that directly references a classic sequence from Stan Lee and Steve Ditko’s original run. Smiles all round then (particularly if you watch both end credit scenes). Now Fox, when are you going to play nice with The Fantastic Four, X-Men and Deadpool?